Brotherhood schools [Братські школи; Brats’ki shkoly]. Schools founded by religious brotherhoods for the purposes of counteracting the denationalizing influence of Catholic (Jesuit) and Protestant schools and of preserving the Orthodox faith began to appear in the 1580s. The first school was established in 1586 by the Lviv Dormition Brotherhood. The school served as a model for other brotherhood schools in various towns of the Polish-Lithuanian Commonwealth, most of them in Ukraine and Belarus: Peremyshl (est 1592), Halych, Horodok (Lviv region), Rohatyn, Stryi, Mykolaiv (Lviv region), Komarno, Jarosław, Kholm, Krasnystaw, Zamość (est 1606), Lublin, Bielsk Podlaski, Brest, Volodava, Pynsk, Kyiv (est 1615), Striatyn, Vinnytsia, Nemyriv, Kamianets-Podilskyi, Medzhybizh, Lutsk (see Lutsk Brotherhood of the Elevation of the Cross School) (est 1620), Volodymyr-Volynskyi, Dubno, Kremenets, Vilnius (est 1587), Minsk, and Mohyliv-Podilskyi. In the first half of the 17th century even some villages had brotherhood schools. The most prominent schools were the Lviv Dormition Brotherhood School and Kyiv Epiphany Brotherhood School. At first the brotherhood schools had a Greek-Church Slavonic curriculum: lectures were in Church Slavonic, and Greek was taught as a second language. (Hence these schools were also called Greek schools.) Then the schools began to adopt the structure and curriculum of the Jesuit schools, using Latin as the primary language, particularly those schools that modeled themselves on the Kyivan Mohyla Academy. 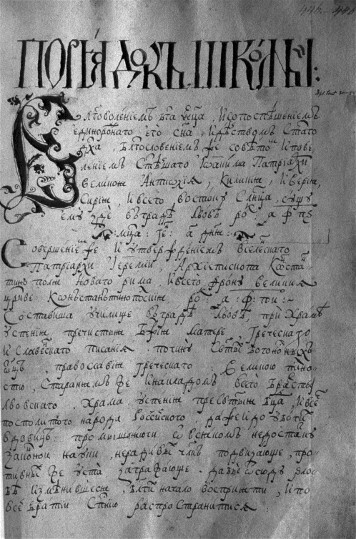 Ukrainian was used only for examination purposes and, from 1645, for teaching the catechism. The curriculum of most of the brotherhood schools provided what was accepted as a secondary education in those times: classical languages, dialectics, rhetoric, poetics, homiletics, arithmetic, geometry, astronomy, and music (church singing). Some schools taught Orthodox theology and Catholic theology (for the purpose of polemics). Brotherhood schools were open to various social strata. Students were judged not by lineage, but by achievement (in contrast to Jesuit schools). Discipline in the schools was strict, and physical punishment was used. Orphans and poor students lived in bursas and student residences. Lecturers were required to set an example by their behavior and to have pedagogical training. Brotherhood schools made a significant contribution to the growth of religious and national consciousness and the development of Ukrainian culture. They published textbooks, particularly language textbooks. The Czech educator J.A. Comenius (Komenský) derived many of the ideas in his Didactica Magna (1628–32) from the practices of the brotherhood schools. At the end of the 17th century and in the 18th century the schools found themselves in adverse political conditions and declined.